This article is about the Scorn Baron. For the Adventure, see Target: The Rider. "Don’t be afraid of dying under our Pikes. Fear surviving." Yaviks, the Rider is a Scorn Baron who leads a personal gang of Pike riders. Riding atop a heavily upgraded Heavy Pike, Yaviks seeks to replace the hierarchy of the Fallen with anarchy throughout the Reef. She is responsible for the destruction of eight Awoken outposts, six Techeun temples, and hundreds of Awoken lives. Locked deep within the Prison of Elders, she was freed around a year after the events of the Red War by Uldren Sov, and was present as he executed Cayde-6. She is an Enforcer-class Baron. Yaviks' Pike is a more heavily modified version of its standard counterpart. Its nose-mounted turrets now deal Void damage instead of Arc, and its shots travel in a slightly more winded trajectory in order to better track their targets; it also comes equipped with launchers that periodically fire a barrage of Scorn Rockets, which can seriously damage or even destroy a Guardian-controlled Pike. 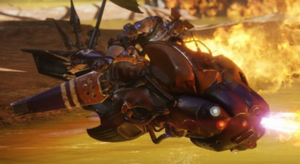 When boosting, Yaviks' Pike emits a flaming trail which burns everything in its wake, and an energy barrier appears on the front of the vehicle to both protect it from damage as well as knock enemy vehicles around by ramming into them. To deal the most damage and take the least damage in return, it is recommended to flank Yaviks from all possible angles. In terms of appearances, Yaviks looks very much like a Scorn Stalker.